﻿﻿﻿﻿﻿At ImagineCreate we wholeheartedly support any organisation that offers opportunities to give children new experiences. Many of the team have grown up in the Guiding and Scouting communities and share many memories of the fun experiences they have had. One of the best memories for the team was gaining badges and filling up the sleeves (on the older uniforms!) full to the brim with these. 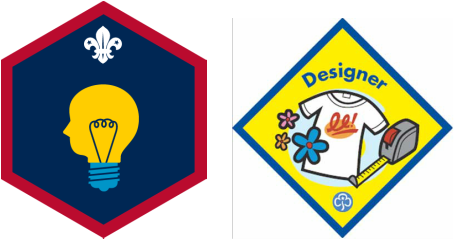 ImagineCreate offers workshops to support Guiding and Scouting organisations in gaining a part of their designer badge in Brownies, and a fun start to the Creative Challenge Award in Scouts. We will attend your unit meeting and run a tailored workshop to meet the needs of your unit. As unit leaders you are more than welcome to join in the fun too! Each participant will get to take home their personal ImagineCreate artwork in a plastic wallet. However, our workshops don't have to be tailored towards any badge! We can just come along and deliver a fun and exciting evening! Rainbows, Beavers, Cubs, Guides, Senior Section, Trefoil Guild! We would be more than happy to visit! Just get in touch with us and we will work with you to plan a great evening*. *Costs apply and more information will be sent to you. As part of the Designer Badge Brownies need to create and design four different items. The artwork and creative activities in this workshop can be used towards items for this badge. At ImagineCreate we can tailor your evening to meet your needs. ​If you would like one of the team to visit your unit please get in touch for more details! As part of the Creative Challenge Scouts need to take part in an activity for over a period of time. ImagineCreate is a starting point towards this challenge. Our creative activities at the beginning of the workshop, and a tailored poem towards this challenge can open the minds of our younger generation.